Learn the meaning of 8 components in Galaxy Note 7 home screen, and how to customize home screen in Galaxy Note 7. What is Galaxy Note 7 home screen? Galaxy Note home screen is the “home” of your Galaxy Note 7. This is similar to all other Android phones and tablets. Normally, you place apps and widgets in the home screen so that you can access them quickly. Otherwise, you have to navigate to apps screen in Galaxy Note 7 to use any apps. In Galaxy Note 7, you can even hide apps screen and put all apps in Galaxy Note 7 home screen. This is a new feature since Galaxy S7. You may check this guide on how to hide apps screen. in Galaxy Note 7 and Galaxy S7. The major difference between Galaxy Note 7 home screen and apps screen is apps in home screen are just shortcuts. This means you can have multiple copies of an app in Galaxy Note 7 home screen (same home screen panel or different home screen panels). In addition, you can remove any apps or shortcuts from Galaxy Note 7 home screen without affecting the apps, But in apps screen, to make an app disappear, you have to uninstall it (if the app was installed by you) or disable it (if it is pre-installed). Some essential apps cannot be disabled. Please note, third-party Android launchers may offer quite different features for Galaxy Note 7 home screen. 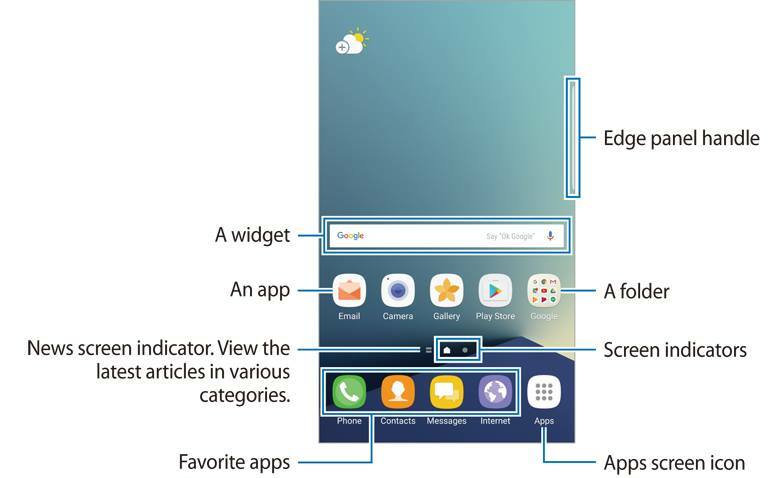 This guide is based on the default Samsung’s TouchWiz launcher. The default Galaxy Note 7 home screen is shown below. Please note, status bar is not included in the screenshot because it is NOT a component of home screen. It is actual a system-wide component in Android. As shown below, there are up to 8 types of components in Galaxy Note 7 home screen. For apps, widgets and app folders, you can mix them in any way you like. For screen indicators and favorite apps tray, they are in all home screen panels. You cannot remove them or have more than one copy of them. You can tap the icon in Galaxy home screen to start the corresponding app. By default, when you install an app from Play store, it will be added to Galaxy Note 7 home screen automatically. Of course, you can disable this feature in Play store settings. Any apps installed on the phone can be added to Galaxy Note 7 home screen. In apps screen, you can tap and hold any apps to add them to home screen. As the apps in Galaxy Note 7 home screen are just shortcuts of the corresponding apps, you can add one app multiple times in Galaxy Note 7 home screen if you want. Although you can add all apps to Galaxy Note 7 home screen, it is not convenient to use them if you have 100+ apps in home screen. The solution is to use app folders in Galaxy Note 7 home screen, with which you can organize apps in the way you want. You can put similar apps into one app folder in Galaxy Note 7 home screen. Widgets allow you to check specific info through the app without opening the app. For example, for weather app, you can get weather info displayed directly in the home screen. So, it is more efficient than starting the weather app, then checking weather info. The space a widget occupiers depends on individual apps. Some apps offer more than one size for different usages. Some widgets may even allow you to re-size them. 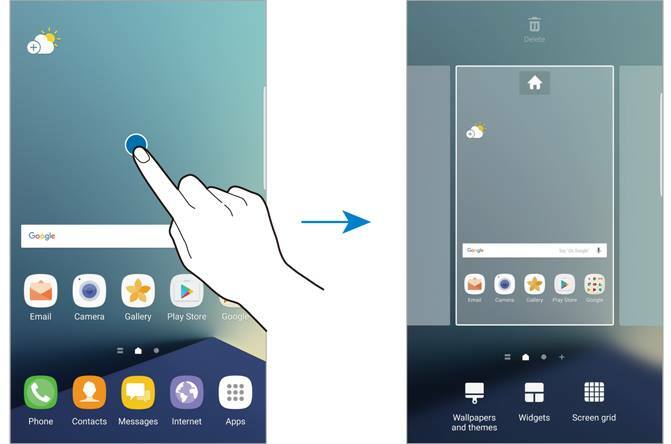 When Galaxy Note 7 has more than one panel (page) for home screen, home screen indicators, which corresponds to each Galaxy Note 7 home screen page/panel, can help you navigate to desired home screen panels quickly. In addition, one (and only one) Galaxy Note 7 home screen panel is defined as the “home” of home screen. If you keep tapping Home button, you will arrive this panel eventually. You can re-assign any panels as home panel later if you want. Galaxy Note 7 favorite apps tray is for you to place frequently used apps or app folders. The favorite apps tray tray will present in all Galaxy Note 7 home screen panels except in flipboard briefing panel. the number of spots are limited to 4 or 5 depending on screen grid settings. If you want to put more apps, you can use app folder in the tray. apps screen icon is always occupy one spot unless you hide apps screen in Galaxy Note 7. The apps screen icon (9 dots) is a shortcut to Galaxy Note 7 apps screen (aka app drawer). Galaxy Note 7 apps screen lists all apps installed in your Galaxy Note 7. Each app can only have one copy in apps screen. In Galaxy Note 7, you can hide apps screen and put all apps in Galaxy Note 7 home screen. You may follow this guide to hide apps screen on Galaxy Note 7. Once Galaxy S7 apps screen is hidden and all apps are put in home screen, apps screen icon will disappear. Flipboard briefing is a controversial feature. Some owners don’t like it since it was introduced. The Flipboard briefing indicator lets you quickly navigate to that panel by tapping the icon. It is always in the leftmost of all home screen panels. You can follow this guide to disable Flipboard briefing on Galaxy Note 7 home screen, or disable the app totally. As mentioned in Galaxy Note 7 specifications, Galaxy Note 7 features a curved screen on both sides. The software feature associated with this curved screen is named as edge screen. You can swipe this handle to open edge screen. For detailed user guide of edge screen, please check this guide. On Galaxy Note 7 home screen, you can tap and hold any empty area, or pinch your fingers together to access Galaxy Note 7 home screen options. This is also often called as edit mode of Galaxy Note 7 home screen. The available Galaxy Note 7 home screen options allow you to customize home screen by adding, deleting, or rearranging home screen panels. set wallpapers and themes for Galaxy Note 7.
add widgets to the home screen. set screen grid to change the size of the grid to display more or less items on Galaxy Note 7 Home screen and Apps screen. There are many ways to customize Galaxy Note 7 home screen. How to manage (add, remove, rearrange) apps in Galaxy Note 7 home screen? How to use widgets in Galaxy Note 7? How to use Galaxy Note 7 themes? How to set wallpapers in Galaxy Note 7? How to hide and disable Flipboard briefing in Galaxy Note 7? How to use edge screen in Galaxy Note 7? Do you understand the meaning of all components in Galaxy Note 7 home screen? Do you know how how to customize home screen in Galaxy Note 7? If you have any questions on Galaxy Note 7 home screen, please let us know in the comment box below.